Window World Chairman and CEO Tammy Whitworth, with members of the Window World Family, present St. Jude with a check for $4.7 million, in honor of the company’s total fundraising for the hospital to date. 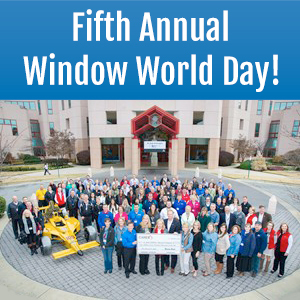 MEMPHIS, Tenn., Dec. 10th, 2014 — Window World®, America’s largest replacement window and exterior remodeling company, celebrated the fifth annual “Window World Day” Thursday, Dec. 4, along with patients of St. Jude Children’s Research Hospital®. The “Jingle Bell Jamboree” themed party was a celebration to honor the patients of St. Jude and their families. The Window World team, comprised of representatives from locations nationwide, hosted various activities, including arts and crafts, a toy giveaway, lunch, a photo booth and live country music. Window World’s philanthropic efforts are spearheaded by its charitable foundation, Window World Cares®, which provides year-round support for St. Jude. During Window World Day, Chairman and CEO Tammy Whitworth presented the hospital with a check for $4.7 million, in honor of the company’s total fundraising for the hospital to date. This amount does not include the $106,000 raised for the recent St. Jude Give thanks. Walk.™ in late November. Also on display at St. Jude was The Window World Stinger, a centennial tribute to the first winning Indianapolis 500 car, the 1911 Marmon Wasp. Currently finishing its nationwide tour to obtain signatures from every living Indy 500 driver, the car is slated for auction in 2015, with 100 percent of the purchase price to benefit St. Jude. At this time, The Stinger features 245 of the possible 270 starter signatures. For more information on The Stinger, visit https://www.WindowWorld.com/the-stinger/. For additional information on Window World Cares and its relationship with St. Jude, please visit http://WindowWorldCares.com/. Window World®, headquartered in North Wilkesboro, N.C., is America’s largest replacement window and exterior remodeling company with more than 200 locally owned and operated offices nationwide. Founded in 1995, the company sells and installs windows, siding, doors and other exterior products, with a total of over 10 million windows sold to date. For the second consecutive year, Window World ranked “Highest in Customer Satisfaction with Windows and Doors” by J.D. Power. Window World is an ENERGY STAR® partner and its window products have earned the Good Housekeeping Seal for seven consecutive years. Window World Cares® was founded in 2008 by Tammy Whitworth and her late husband, Todd. The foundation provides funding for St. Jude Children’s Research Hospital®, where it was named New Corporate Partner of the Year in 2010. Since its inception in 2008, the foundation has raised over $4.5 million for St. Jude. To learn more about Window World Cares or to donate, visit: www.WindowWorldCares.com.